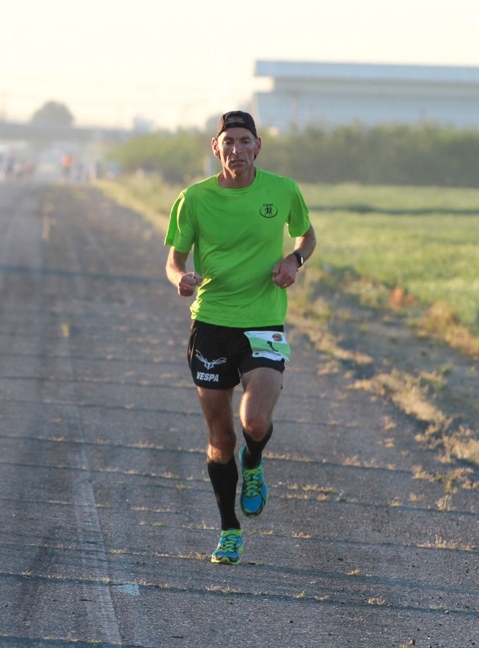 Jon Olsen ran 167.568 miles in 24 hours. You thought a Marathon was long? 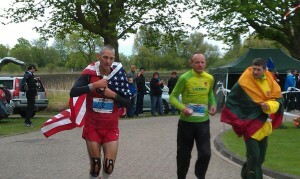 Victory for Jon Olsen, USA after running 24 hours. Modesto’s Jon Olsen won the International Association of Ultrarunners 24-Hour World championships. 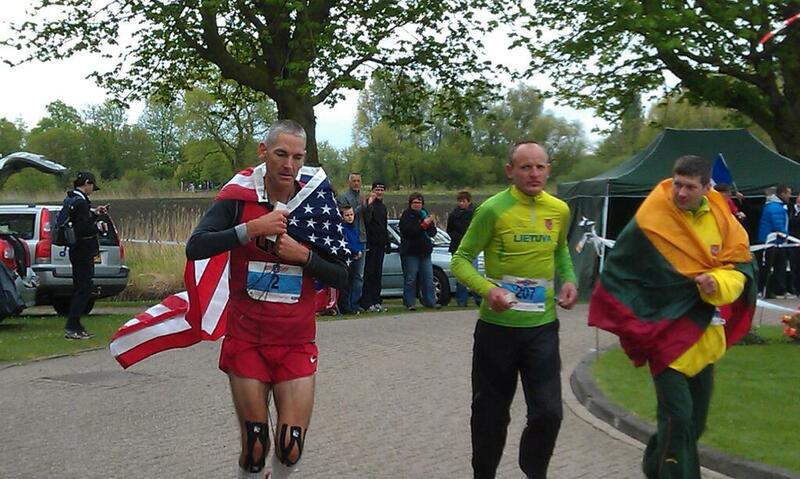 Representing the USA, Mr. Olsen ran 167.568 miles taking the lead by 4 miles. Reading reports of the race, the weather conditions were challenging which included rain and hail which pelted the runners throughout the night. 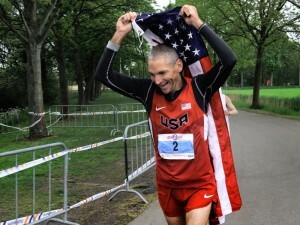 Individually Mr. Olsen won, and as a team, the men’s USA team won as well. Each team was composed of six runners, and each team’s top three distances were combined for the team score. As blessed as I am physically to run, I’m even more blessed with the amount of loving people that God has surrounded me with. All I can do is say thank you and represent Modesto and the Red White and Blue to the best of my ability. Thank you once again! Sorry I haven’t posted anything but between the drug test, awards ceremony, the nap, shower, dinner, and packing for my flight that leaves early enough my alarm is going off at 6am…I have had little time. Let me quickly sum up the race and you can read about it in the Modesto Bee Tuesday. How does Jon Olsen’s measure up to American Records? He now holds the second place American record behind Florida’s Mike Morton who ran 172.457 set in 2012. Less than 5 miles away from Jon’s winning distance. You can see a list of ultramarathon record accomplishments around the world and Jon Olsen is listed on there more than once. 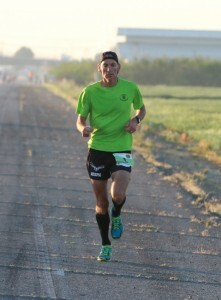 He has won the Surgical Artistry Modesto Marathon twice, and is a coach for the Teens Run Modesto program. And we’re certainly proud to have Jon Olsen in Modesto. He’s a great role model for all of us, in our quest for hard work and excellence. He is also proof to us that anything can be done at the highest level in Modesto. This means a lot to us as we set out to continue our excellence in plastic surgery and acupuncture. He’s one of the great things about Modesto. 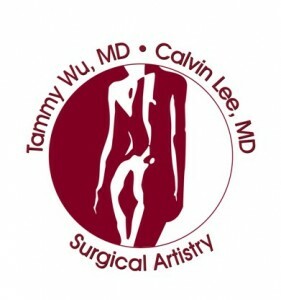 Surgical Artistry Modesto Marathon March 24, 2013. Jon Olsen’s picture by Captivating Photos, in Modesto, CA, USA. This entry was posted in Education, Modesto, News, Running, Wellness and tagged 24 hour race, excellence in Modesto, jon olsen, junior high, math teacher, Modesto, netherlands, prescott, ultramarathon on May 13, 2013 by Calvin Lee, MD.